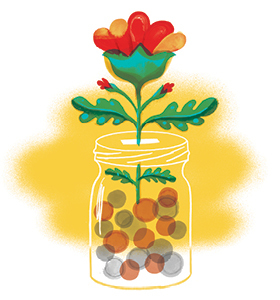 story by Leah Pillsbury | illustration by Jim TierneyNot all of us have the privilege of a savings or retirement account, but for those that do, how often do you stop and ask: what’s my money up to? That’s the question I posed to potential investors during my time as a fundraiser for the Mariposa Food Co-op expansion project. The more I asked this question, the more I began to understand that the money we save can be as powerful a tool for change as the money we spend. As a fundraiser with Mariposa my job was to convince food co-op members and neighbors in West Philadelphia to park some money with the co-op for a few years. Their investments would help cover the costs of purchasing and renovating a new store, and once the co-op was in its new space, and turning a profit, investors would get their money back—in many cases with interest. The conversations I had inevitably included lines like: “Wouldn’t you rather see the money invested in your savings account be put to work for a project you care about?” I pitched it as an opportunity to align an investment with their values. Just as many co-op members were striving to make responsible choices with their consumer dollars—buying Fair Trade coffee or organic carrots—I encouraged them to make a responsible choice with their saved dollars. The first investment vehicle I committed was a loan to The Reinvestment Fund, a Philadelphia-based nonprofit financial institution that finances schools and housing, among other neighborhood revitalization projects. Then, I invested in RSF Social Finance, a nonprofit financial services organization in San Francisco that lends to educational, agricultural and environmental social enterprises around the country and world. Somewhere in there I also made the choice to move my checking and savings accounts from a big bank to my local credit union. And, of course, I made a loan to the co-op. I can’t claim that this approach is new or particularly innovative. The idea of investing in companies or projects whose missions you support, and divesting from those you do not, has a long history. For example, the 1980’s anti-Apartheid movement successfully organized large-scale divestment from companies doing business in South Africa. More recently, the California teachers’ pension fund—the nation’s largest—took the first steps towards divesting from gun and firearms companies, following the school shooting in Newtown, Conn. Philadelphia’s pension board is following suit, having voted to drop investments with gun-related companies should they fail to adopt certain standards. While these strategies exist, it’s rare that individuals to invest with a social return in mind as much as a financial one. This isn’t so surprising, considering that my own journey to discovering new socially responsible investment opportunities wasn’t always easy. Sometimes I felt hindered by my ignorance about finances or debilitated by the guilt of having more than I needed. However, the key, I found, was to keep at it, even when it got complicated—because leaving my money untouched didn’t harness its power. And why not use that power for good? After completing the Mariposa Food Co-op capital campaign, LEAH PILLSBURY joined Common Market, a nonprofit local foods distributor, as their director of development. She can be reached at leahpillsbury.com.